Back in June, Joya de Nicaragua announced the reintroduction of the Clásico line to the U.S. market. The move to bring back “the first Nicaraguan cigar ever” seems fitting at a time when the company is celebrating its golden anniversary. In a departure from the powerful smokes for which the company is known, Joya is marketing Clásico as “mild” and “creamy.” The recipe remains the same as it did decades ago. The wrapper is Cuban-seed Ecuadorian Connecticut, and the binder and filler tobaccos are, of course, Nicaraguan. There are a whopping twelve formats, so there’s a size here for everyone. 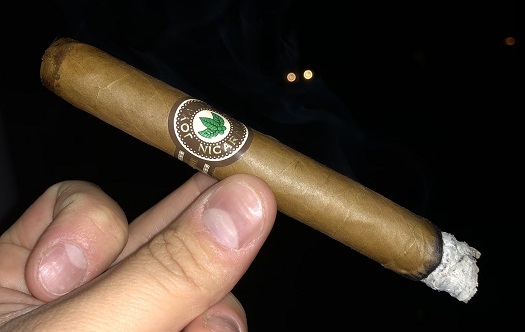 The Toro may have been the first Clásico I tried (and also reviewed), but the thin Número 6 (6 x 41, $6.50) is the most appealing to me in terms of dimensions. I tend to gravitate towards narrower ring gauges, whenever possible, and six inches long seems just about perfect in terms of smoking time. Like the Toro, Número 6 has a traditional, understated, and—in my opinion—beautiful band that nicely highlights the golden color of the smooth, buttery wrapper. At the foot, I find bright, crisp pre-light notes of sweet hay. The cold draw is smooth, especially for such a thin cigar. The initial profile is salty and abrasive. Fortunately, after just a couple puffs, things settle down nicely. Individual flavors include creamy butter, warm tobacco, and raw almond. There’s also a green freshness that’s hard to put my finger on. The mild- to medium-bodied cigar has a bready texture. The Número 6 mostly remains this way until the end, save for the occasional additions of tastes like clove, café-au-lait, and white pepper. Along the way, the physical properties are mostly admirable. I found a straight burn line, smooth draw, and good smoke production. On the downside, the ash is very flaky and prone to fall off prematurely, and the burn requires a few re-lights along the way to stay burning. As I wrote of the Toro, I enjoy mild cigars. But mild cigars need to have flavor. The Clásico Toro has flavor. At times it shines, and at times it falls a little short. All told, I think the most appropriate rating is three stogies out of five.